Have you ever considered becoming a Foster Grandparent???? If you are over the age of 55 and looking for a way to make a difference in students’ lives, consider becoming a foster grandparent through RSVP of Dane County. We ask for you to commit to a training program, live in Dane County, be income eligible and give just 5 hours a week working one-on-one with students at their school. As a foster grandparent you will receive a tax-free stipend, mileage and lunch reimbursement. To find out more about the foster grandparent program call RSVP of Dane County at 608-238-7787. Volunteering your time and talents as a foster grandparent helps not only a child succeed in school, it benefits our whole community as well. 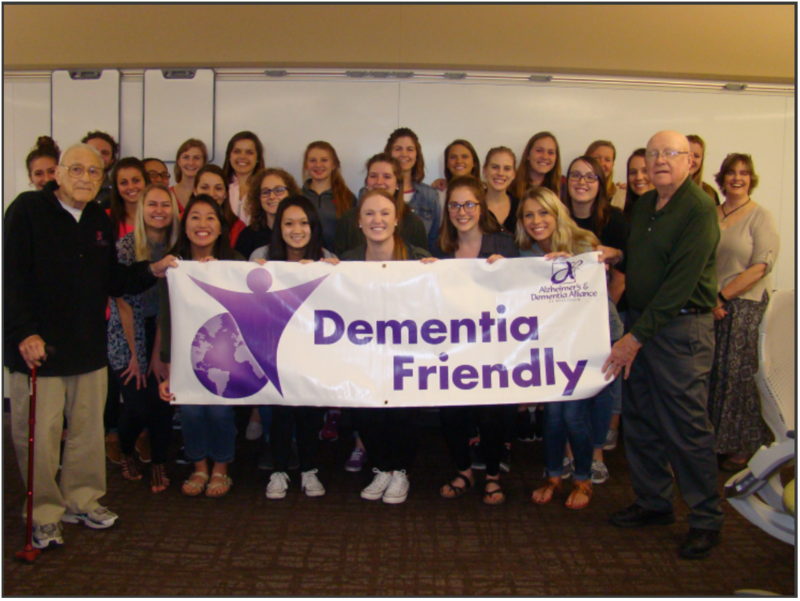 Pictured holding a banner with a group of nursing students is our own John Scharer (far right) and Don Kirschner (far left) who have been volunteering their time for several years to educate communities and organizations on how to become dementia friendly. On June 21, the UW-Madison School of Nursing launched their “Dementia Friendly Toolkit” which includes training materials to help healthcare staff, service providers, family members and others better communicate with and advocate for people living with dementia. We thank John and Don for their dedication and contributing their talents and knowledge to improving our larger Dane County community.